How can I detect a hang in QEventLoop? Finally I start the event loop for the application and when I run the program and the window shows up click the button. This will in my case stall the entire application. So my question at this point is how can I "detect" that this kind of hangup has occurred in my application from the code? I know writing code that does not return in the signal handler is bad practice, I ask this question because I want to detect errors and recover from them, possibly by restarting the application altogether in an effort to improve resilience when in production. To detect a hung event loop, you need to wrap the operation that can hang the event loop, to detect when it takes too long. The "operation" is the QCoreApplication::notify member. It is called to deliver events to all event loops, in all threads. An event loop hang occurs when the code that processes an event takes too long. When notify is entered for a given thread, you can note the time of entry. A scanner running in a dedicated thread can then iterate the list of such times, and pick up the threads that have been stuck for too long. The example below illustrates this, with histograms, too. A thread with an event loop that was stuck longer than the timeout threshold will be highlighted in red. I also illustrate how one can wrap a viewmodel around a data source. Qt 5 and a C++11 compiler are required. Note: The runtime warnings QBasicTimer::stop: Failed. Possibly trying to stop from a different thread are not a real issue. They are a Qt bug of only cosmetic consequence and can be ignored in this particular case. You can work around them -- see this question. /// The value binned to contain at most \a binaryDigits significant digits. /// The less significant digits are reset to zero. /// A safely destructible thread for perusal by QObjects. /// An application that monitors event loops in all threads. /// A saturating, binned histogram of event handling durations for given thread. /// was entered, or zero if no event handler is running. auto result = Base::notify(receiver, event); // This is where the event loop can get "stuck". /// The event loop for a given thread has gotten stuck, or unstuck. /// The first event was received in a newly started thread's event loop. /// The thread has a new histogram available. /** This signal is not sent more often than each updatePeriod(). /// The thread has finished. If the slot invocation is delayed by a significant w.r.t. the expected timer timeout, your event loop has been stuck somewhere. This will let you know there has been a problem, but won't tell you where it got stuck. Send periodically a signal to an object living in the main thread (or send an event; a cross-thread signal is implemented via events anyhow); the slot connected to that signal sends a signal back to the thread. If the "pong" takes too much (you can have a separate timer in the thread) do something -- abort(), raise(), i.e. an action which will cause a debugger to stop and you to see the main's thread stack trace, to deduce where you got stuck. Note that since you're running a separate thread you can't just pop up messageboxes or similar -- no UI in other threads! At most, log the event. Qt's event loop emits some signals (see QAbstractEventLoop), in theory you could attach to those in a separate thread and detect if control is not returning to it any more. Or, subclass QAEL to the same means. Same ping/pong concept, but using separate processes -- write a small TCP / local socket client which periodically sends a ping to your application, if the pong doesn't get back in a short while act (now you can also use an UI). Not the answer you're looking for? Browse other questions tagged qt qt5 hang recover event-loop or ask your own question. How to monitor QT signals? 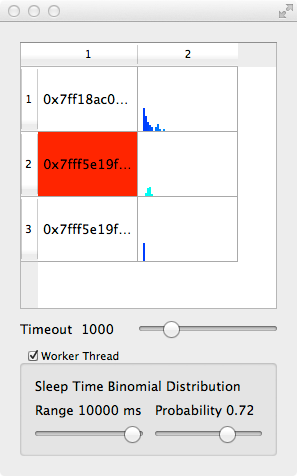 How to prevent the QBasicTimer::stop: Failed warning when objects become threadless? Can I get Qt to profile signal-slot execution duration? Any way to detect if a QObject belongs to a “dead” QThread?